Six exceptional photographers from across the country define street photography in their own terms and images by offering an intimate series of non-commissioned work taken in each of their hometowns. Each series provides us with an often-surprising view into the ordinary. 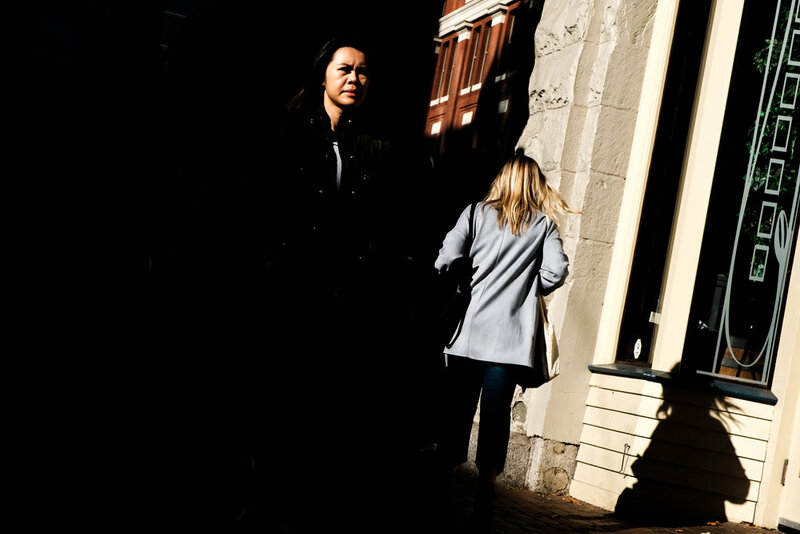 Casting the everyday in an unfamiliar light shows us the potency of street photography to reimagine our environment through a new lens. In the case of these six photographers, their lenses reveal the valuable perspectives of parents, professionals, travelers, immigrants, teachers, and artists. I have never thought about how being a girl has affected my photography. I am just a photographer and I love taking pictures of people, whether it’s street, portrait, or my family. Of course, it is generally more difficult for girls to get jobs but platforms like #girlgaze are helping. These photos are from a series called “At Night We Awaken” because I feel like I wake up when everyone else is asleep. Sometimes I end up in sketchy areas, but I love seeing the remnants of the day, traces of what has happened. I feel like my photos can spark the stories from the day that people who were there might not tell. I don’t think people see Kitchener in these photos, and it makes me so happy to show them something familiar in ways they couldn’t have imagined. When I moved here from Toronto I realized I was the only person on the street taking photos. People are constantly trying to get behind my lens to see what I see. I stopped working as a photographer when my daughter was born five years ago. Being creative wasn't on my radar then, and I wasn't about to take out all my equipment with a baby. It was about a year and half before I started photographing again; as I pushed the stroller around Ottawa, I started taking pictures with my iPhone. I had taken a lot of street photography with my camera when travelling before having my daughter. In India, people would actually ask me to take their photo. Even if they would never see the image, they seemed happy just to have the experience of having their photo taken. I loved the connection I could make with people when this happened, and it made me consider the value of the image. 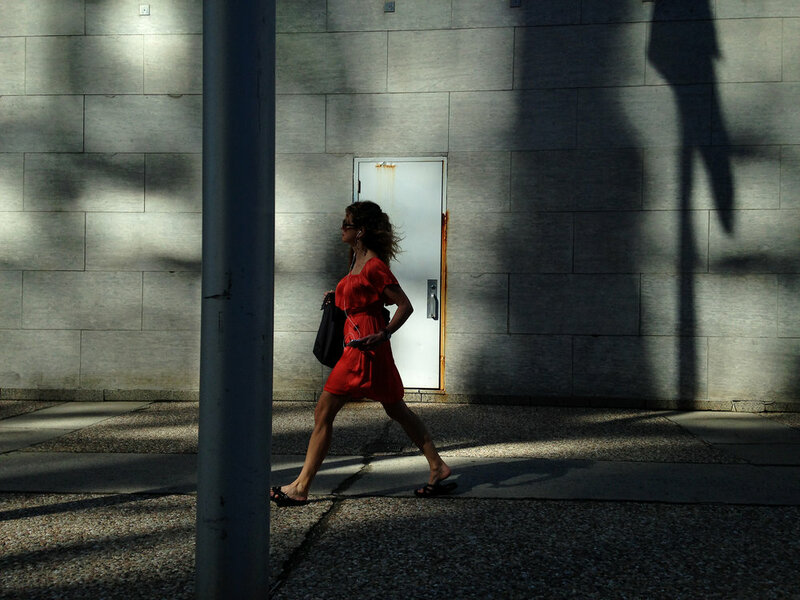 Street photography at home is different though—I was nervous to photograph Ottawa at first. What comes naturally in another city, where everything is unfamiliar, feels so different at home. I direct as little as possible in my professional work because I don’t like messing with what’s natural. I like things to feel authentic. So now all of the work I do is influenced by my street photography, but I have no idea what the rules are. When I observe my family doing things, is that “street”? When I was seven or eight, my uncle started teaching me about photography with his collection of antique cameras. My parents said I was too young to have a camera, but he still showed me how everything worked. I got a Polaroid camera when I was 12 and I loved it. Its shape reminded me of the bellows on my uncle’s cameras. I am a professional photographer now, but I was trained as a structural engineer. Both are fields where not enough women are recognized. When I was in engineering a tenth of my colleagues were women, now that I’m a street photographer it feels the same way. I taught structural engineering and math at BCIT for over twenty years and I always worked my photography into lessons. Geometry and structure have a heavy influence in the way I photograph. When I wanted my students to work through a structural design problem, I would show them images I had taken. This helped them see how theory and real life came together. I think I was doing street photography before I knew it was a genre. But I used to try and avoid people in my photos. Now I love having people in them! I don’t really go out with an agenda, things just happen organically. I think in a way it’s actually easier for me to photograph the streets as a woman, people just feel more comfortable with you hanging around. I love the edges of the city. I love the narratives the form on the shoreline. A totally different community reveals itself here. Sometimes when I read about photography, I feel like I’m always being told, “you need a project.” But I really like just going out waiting for a story to catch. I try to capture the private unguarded moments of people moving through their day. I’m an actor and once a director said to me: “This character speaks to discover what she’s thinking.” This idea has stayed with me and it’s influenced my photography. I think I photograph to discover what I see. I try not to go out with anything predetermined because it closes down the narrative. I make photographs to see what is there. I have lived in the Beaches, east of Toronto on the shores of Lake Ontario, for 25 years. In the last five years I have rediscovered my community as a photographer and find I am engaging with the neighborhood in a completely different way. Watching life unfold by the water and trying to capture the ordinary moments of life, is why I like to make photographs. These photos of my dogs, Ghillie and Tangle, were taken all over Canada. Ghillie was attacked as a puppy so he’s called a “reactive” dog now. I try to take him out of Toronto once a week to get him off leash. We’ve travelled all over the east coast and I’ve started practicing ideas on them, like street shots but with dogs. It’s not always conscious, but when I want try something new it usually ends up in a photo of my dogs. By travelling with my dogs I have become part of a coursing community. Photographing some of the people I have met in personal moments with their dogs during a race is a real privilege. It’s taken me a long time to discover that I need this personal connection to take a great photo. I started strictly as a street photographer. I didn’t know what it was, but I loved Helen Levitt. So, I would just stand on street corners and do stuff. As I grow as a photographer, I have started to seek out connection more and more; it’s what I need to take good photos. If this means I am not taking street photography anymore, that’s ok. I’d rather just be a good photographer. I have lived in Montreal since I was born. I don’t remember when Place des Arts was built, but when I started doing photography, in autumn 1978, it was there. I usually go out with an idea, shooting the things I am thinking about and looking for similarities in content and form. I live on Le Plateau and photograph all over Montreal, but Place des Arts is an important meeting point and I often end up there. These photos are a new cross section from several different series I have shot over the years. For each series, I ended up back at Place des Arts for one reason or another and I now have images of the plaza from 1980 to 2018. Many things happen there, but when nothing is going on, it’s very transient. When I started doing photography, the term “street photography” didn’t exist, but I loved Henri Cartier-Bresson especially. In his 1952 book Images à la Sauvette, he refers to the idea of the decisive moment, this idea was important to me as I photographed the city. I love this quote of his on photographing: “c'est retenir son souffle quand toutes nos facultés convergent pour capter la réalité fuyante; c'est alors que la saisie d'une image est une grande joie physique et intellectuelle.” In English, you might say: Photography is holding your breath when all capacities converge to capture a fleeting reality; it’s in this moment that capturing an image is a great physical and intellectual joy. Džesika Devic is a self-taught film and digital photographer. In 2007 she received her first film camera and began to photograph the mundane. 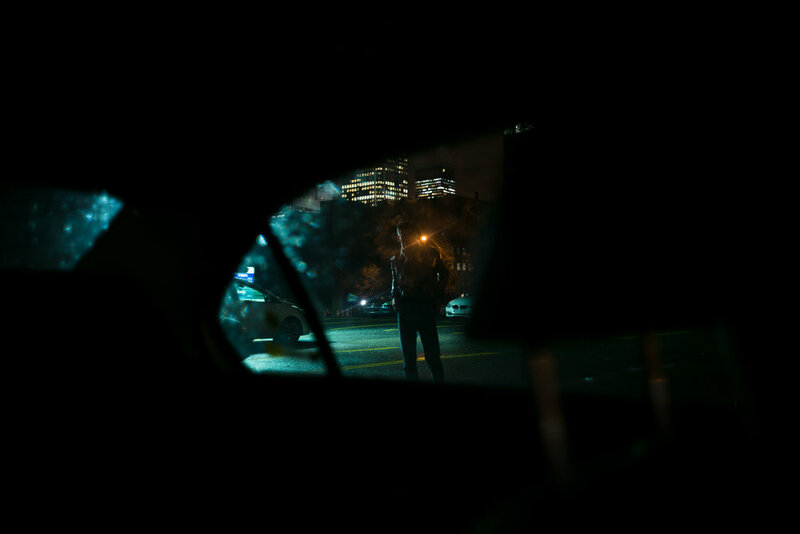 Her photographs span subjects and explore different mediums, but storytelling is a constant thread. Angela Gordon is an Ottawa-based photographer of people and places, she is influenced by documentary and street photography. Her freelance photography of Ottawa has been published in Edible Ottawa, Ottawa Magazine, Where Ottawa, and Ottawa Tourism’s Visitor Guide. Elizabeth Gray grew up in Vancouver and has lived across the southern United States. She has been photographing for over 40 years—subjects ranging from landscape and wildlife to architecture and street—and now teaches photography in Vancouver. Maria Ricossa is an actor, photographer, and teacher. In front of the camera she strives to recreate truthful behaviours and honest reactions. Behind the lens she seeks out the same unguarded moments as she photographs the street. Siri Thompson was born and grew up in Jamaica, where her family kept various animals, including dogs, goats, and a cow named Sheba. 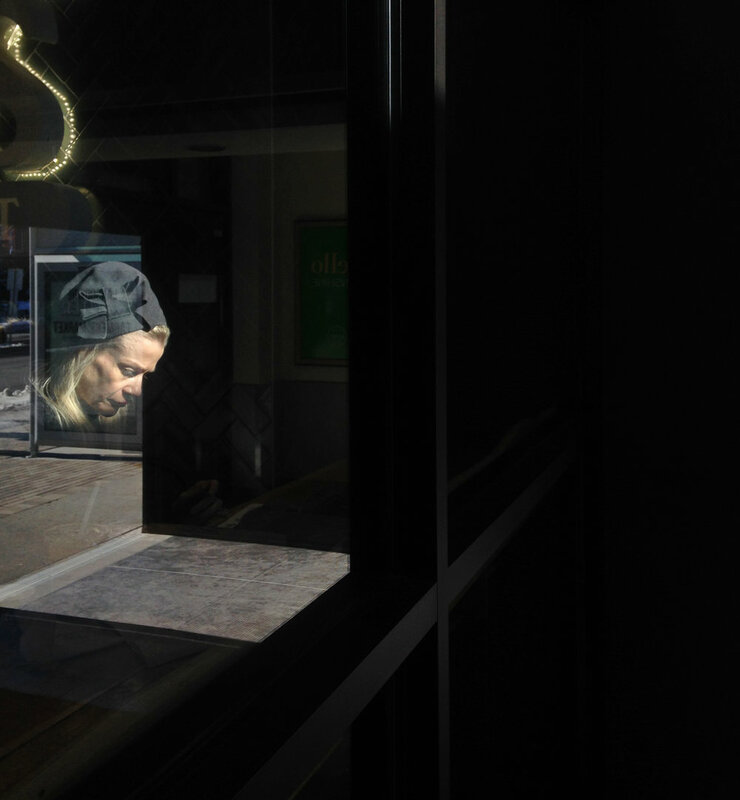 She photographs primarily in Toronto, where she lives. Louise Verdone is a Montrealer since birth. She studied Fine Arts at Concordia University where she first pursued street photography, believing it to be a most accessible and democratic artistic medium.